If you want more than one domain name to bring up your site, Winhost provides an easy to use Domain Pointer service. By default, the domain pointers point to the root of your primary hosted domain. They are primarily used to direct multiple domains to the same site. You can direct domain pointers to subdirectories, but that requires a bit of redirect coding. This article doesn’t address that, but we do have Knowledge Base articles to help you down that path. So if you want to add a domain pointer, here’s all you have to do. Log in to Site Manager in Control Panel. In the Site Tools section, click the Domain Pointers icon. Once you’re in the Domain Pointer section, click the Add button. Now enter the domain name that you wish to point to the existing site and click the Create button. It’s important to note that the domain pointer order is not a domain registration system. 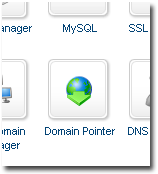 If you need to register the Domain Pointer, click the Domains tab in Control Panel. Once the new name is registered, come back to this process. You probably noticed the big red question mark in the image above. Do you want to be able to use email on the Domain Ponter? If so, make sure you check Enable Email Alias. That will activate an alias-based email service for the Domain Pointer. What that means is any email address on your primary domain will also accept messages sent to the same address on the new pointer domain. 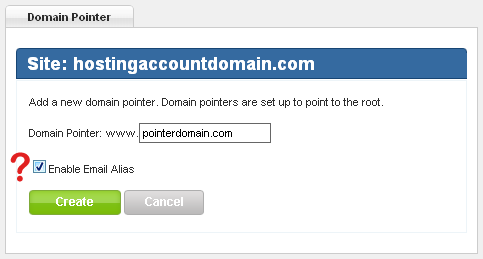 For example, let’s say your primary domain is primary.com, and you use pointer.com as a domain pointer. If you set up the email address info@primary.com, that mailbox will also accept mail for info@pointer.com. Any pointer.com addresses have to point to an email address on the primary domain name. sales@pointer.com will not work unless sales@primary.com exists. For more information on Domain Pointer Email Aliases, see this Knowledge Base article. If the name servers already point to Winhost, the Domain Pointer should work right away. If not, allow 24 to 48 hours after changing the name servers for the Domain Pointer to start to resolve to your main site. Need help changing name servers for your domain? Here are instructions for updating name servers for some popular registrars. I had a hard time finding this solution. I kept looking using the wrong terms. Maybe these will lead someone here who needed the same answer I did. Hunter, I’m glad you (eventually) found what you needed!